Washington (CNN) -- The U.S. House on Monday passed the debt-ceiling deal worked out by President Barack Obama and congressional leaders, sending it to the Senate for consideration a day before the deadline for the government to face possible default. Senate Majority Leader Harry Reid announced his chamber will take up the measure at noon on Tuesday. No amendments will be allowed, and approval will require a super-majority of 60 votes in the 100-member Senate, Reid said. On Monday, the House overcame opposition from liberal Democrats and tea party conservatives for ideologically different reasons to pass the measure by a 269-161 vote. One of those supporting the plan was Rep. Gabrielle Giffords, D-Arizona, who cast her first House vote since being shot in the head in an assassination attempt in January. 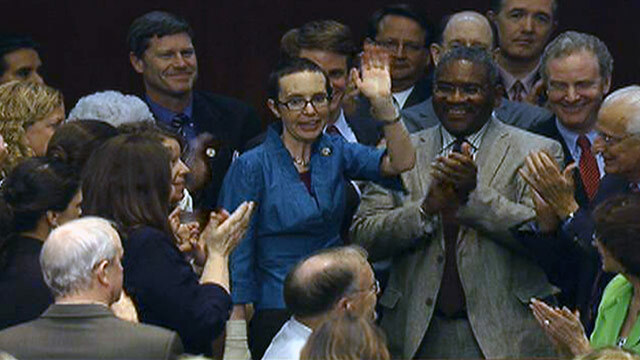 In an emotional moment, Giffords entered the chamber during the vote and received a prolonged standing ovation from her colleagues. House Minority Leader Nancy Pelosi hugged Giffords as other House members mobbed her, and the commotion diverted attention from the ongoing vote total showing the measure would pass. The agreement reached Sunday by President Barack Obama and congressional leaders from both parties calls for up to $2.4 trillion in savings over the next decade, raises the debt ceiling through the end of 2012 and establishes a special congressional committee to recommend long-term fiscal reforms. The legislation needs to reach Obama's desk by Tuesday at the latest. If the current $14.3 trillion debt limit is not increased by that point, Americans could face rapidly rising interest rates, a falling dollar and shakier financial markets, among other problems. A number of Republicans worried about cuts in defense spending and the lack of a required balanced-budget amendment to the Constitution. Progressive Democrats were livid over the extent of the deal's domestic spending cuts, as well as the absence of any immediate tax hikes on wealthier Americans. House Speaker John Boehner, R-Ohio, was able to round up the support of most of his GOP caucus, while the chamber's two top Democrats -- Pelosi of California and Minority Whip Steny Hoyer of Maryland -- voted for the plan along with more than 90 of their caucus members. Still, emotions ran high after months of grueling negotiations that pitted the small-government, anti-tax ideology of conservative Republicans against Obama's call for balancing spending cuts and entitlement reforms with increased tax revenue to spread the pain of necessary deficit reduction steps. This "may be the single worst piece of public policy to ever come out of this institution," declared liberal Rep. Maxine Waters, D-California, while Pelosi noted the measure "makes these big cuts and has ... not one red cent from the wealthiest people in our country -- no revenue." At one point, more than a dozen protesters caused a disturbance in the House gallery by chanting against Speaker John Boehner until Capitol Police officers removed them. Vice President Joe Biden spent much of Monday on Capitol Hill, trying to persuade unhappy Democrats to back the proposal. "I am confident that this will pass," Biden asserted. "We have to get this out of the way" in order to turn Washington's focus to job growth, he said. Boehner and other House leaders said the deal would start reshaping how Washington spends taxpayer money, which was the goal of conservatives who elected Republicans to a majority in the House last November. "The bill is not perfect ... but changing the way that Washington spends tax payers dollars is often a lot like redirecting or turning an aircraft carrier." said House Majority Leader Eric Cantor, R-Virginia. "It's a monumental task." Boehner acknowledged that Republicans on the Armed Services Committee were concerned about cuts to military spending in the agreement, but he told reporters he believed they would support the proposal. What exactly did House just vote on? "As I told them, this is the best defense number we're going to get, and frankly if we don't pass the bill, it's pretty clear to me what'll happen ... the defense number will go down," Boehner said. The agreement revolves around a two-stage process. The first stage includes $917 billion in savings, including a roughly $420 billion reduction in the national security budget. The cuts would be accompanied by a $900 billion increase in the debt ceiling. Because of the pending Tuesday deadline, Obama would have immediate authority to raise the debt ceiling by $400 billion, which will last through September, according to the White House. The other $500 billion increase in the debt limit would be subject to a congressional vote of disapproval that can be vetoed by Obama. In the second stage, a special joint committee of Congress would recommend further deficit reduction steps totaling $1.5 trillion or more, with Congress obligated to vote on the panel's proposals by the end of the year. The committee would comprise 12 members: Six from each chamber, equally divided between Democrats and Republicans. The panel's recommendations would be due by November 23 and guaranteed an up-or-down vote without amendments by December 23. The committee is expected to consider politically sensitive reforms to the tax code and entitlement programs, though Democrats and Republicans disagree on the likelihood of any eventual revenue increases. If the committee's recommendations are enacted, Obama would be authorized to increase the debt ceiling by up to $1.5 trillion. If the recommendations are not enacted, Obama can still raise the debt ceiling by $1.2 trillion. At that point, however, a budget "trigger" would kick in, imposing mandatory across-the-board spending cuts matching the size of the debt ceiling increase. The cuts would be split between defense spending and non-defense programs, an unpopular formula intended to motivate legislators to approve the committee's recommendations. "You want to make it hard for (lawmakers) just to walk away and wash their hands," Gene Sperling, the director of Obama's National Economic Council, said Sunday. "You want them to say, if nothing happens, there will be a very tough degree of pain that will take place." The final debt ceiling increase in the agreement would also be subject to a congressional vote of disapproval that can be vetoed by Obama. The agreement calls for both houses of Congress to vote on a balanced budget amendment to the Constitution, though it does not make a further increase in the debt limit subject to congressional passage of such an amendment -- something tea party conservatives were initially demanding. In a key concession to Democrats, benefits from entitlements including Social Security, Medicaid, Medicare -- as well as veteran's benefits -- will be exempt from any immediate cuts. Leaders on both sides of the aisle have conceded that the deal is far from perfect. Reid emphasized that "no one got what they want" and "everyone had to give something up." But this "is a great stride forward" that shows "we can succeed not in spite of our divided government but because of it," he said.